It is true that 98% of the population in Turkey are Muslim people but , in the secular country you can find variety of choices for Alcoholic and Non Alcoholic drinks in Marmaris. Drinking in Marmaris Turkey can be fun , here we wanted to metion afew local drinks in Marmaris. Raki is a traditional alcoholic drink, which is prepared on the basis of grape and raisins, seasoned with piquant anis and is diluted with water (in proportion 112 or 1/3).. Thus the drink gets vittite milk colour, therefore it is called lioness’s milk. The beginning of the production of vine in Anatolia reaches deeply the ancient times, as far as Hitties times, The choice of vines is great we recommend to try dry, white and red, of such trademarks as -Villa Dolucar. 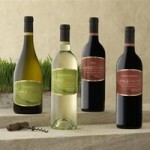 Cankaya ,Kutman,Kayra,Kavaklidere and for lovers – fruit sweet vines like pomegranate, cherry. 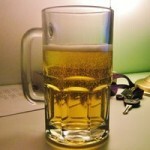 If you are a lover of this drink – you will always be able to find good beer in Turkey. The most widespread are Efes and Tuborg. Traditional drink from yogurt with water and salt. It goes well with the dishes from fried mutton and it is recommended to drink it in hot months as the fresh drink. They say that you should go for the beer to the Bavarian and for the tea to the Turkish. Tea is drunk and served everywhere in small glasses, in the form of a tulip, with saucers, which are called “bardak”. The first question of the Turkish: is Nasilsin? (How are you ? 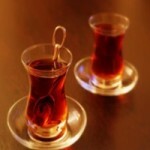 ), the second one necessarily – “Cay icermisiniz?” (“Would you like tea?) Turkish tea is always freshly boiled. There are also fruit teas – apple, orange,lemon, mint..
Coffee comes from Ethiopia. It came to Turkey in 16 century through Yemen. Coffee is not cultivated in Turkey. So why is it called Turkish? Turkish is the way of its preparation, presented in Europe by the Turkish-Ottomans during the siege of Vienna in 16 century. 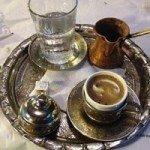 The drink is prepared from very finely ground coffee with water and sugar, in turka , on quiet fire. Sugar is added to taste, therefore let the waiter know in advance how much sugar you want. Sade (without sugar), Az sekerli (a little sugar), Orta (average sugar), sekerli (sweet). Turkish coffee is drunk by small gulps. After you have finished you should gargle your mouth with water, which is served in glass simultaneously with coffee. Dont drink coffee up to the end, otherwise you will take the full mouth of coffee grounds. Turkish coffee is drunk at any time. especially after meal, but not after breakfast. It is considered that after square dinner you need to drink a cup of coffee or make forty steps. It promotes digestion. If you are invited for supper into ‘Turkish house, you will necessarily be offered coffee. 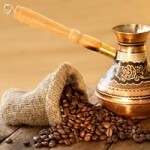 Enioy your Turkish coffee. Don t forget about the tradition connected with it , the offered cup of coffee is a sign of hospitality, gratitude and respect. The expression “I drank his coffee” expresses friendly ties, and the shared cup of coffee means fidelity and respect. The only one cup of coffee is worth forty years of attention and respect. So, for one cup of coffee you acquire a friend.